- Due to the caliber and tier of the gun, the penetration does not drop that much over range( 100m=299mm; 500m=289mm). - Its engine is placed in the front making it easily damaged by HE shots at frontal gun mantlet. The Jagdpanzer E-100 takes another leap of size and lack of mobility. Even slower than the Jagdtiger, this is a TD which should never be left alone, as all it takes is one rather mobile tank to flank you and mercilessly kill you. Your 17cm gun features a quite good 299mm penetration, and 420 with premium ammo, which should allow you to penetrate most things that cross your path. Be careful not to aim at the middle of the tracks, especially when using HEAT, as the tracks will probably absorb all the damage, essentially wasting your precious shot. You DO NOT want to waste a shot when your reload time is almost half a minute. Each shot deals on average just a bit over 1000 damage. This is quite intimidating, as it's almost half the HP on most tier X tanks. This makes you one of the most feared tanks on the battlefield, so use this to your advantage. It also means you can trade quite favorably with most tanks you will face, as they do less damage per shot. Going to the frontline side by side with your team's heavy tanks can be a valid option, since you have the armour for it. Their presence will ensure that no one dares to chase you after delivering your shot and falling back for reloading. It is also quite effective at holding a defensive position at the end of a corridor. Your superior gun softstats in comparison to the FV215b (183) will make it easier to place your AP and HEAT rounds where you want them at for penetrating hits. Mobility is a big problem for the JagdPz E-100. You have a measly 8.96 hp/t, which gives you mediocre acceleration, and a poor traverse speed as well. Any tank with even decent mobility will be able to outmaneuver you if it finds you alone. You should always try to have someone nearby that can help you. Luckily this TD has pretty good armour. It may not be T110E3 kind of armour, but it does the job. By this point you should already know how to angle your tank properly to increase your effective armour. Properly angling the JagdPz E-100 will allow to bounce even Tier X premium shells. You want to hide your lower glacis if possible. While not as weak as on the Jagdtiger, it still allows most tanks to easily penetrate you. The Jagdpanzer E-100 suffers a quite a bit on random matches, where you may find teams that will leave you on your own, or insist on advancing when you aren't even near a good position for shooting. On Clan Wars or Tank Companies, however, where there's coordination on the entire team, this TD can do quite a good job. And even just a simple 3 man platoon can greatly increase your performance in random battles (keeping you safe from flanking attempts, covering your own advance, etc). Possible versions of the Jagdpanzer E100 that Wargaming may have considered for this TD. 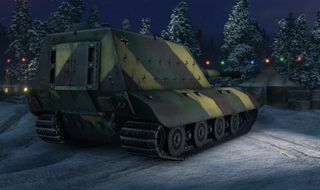 The Jagdpanzer E-100 as it currently is in the game is a vehicle based on proposals to fit a 17 cm gun on the chassis of the E-100 to act as a tank destroyer. Two guns were developed by the Krupp design bureau in late March of 1944, the 17 cm StuK L/53 and the 15 cm StuK L/63. According to calculations, both could penetrate 200 mm of armour at 4 kilometers. It is not known who the intended target for these monsters was, but both guns appear in Guderian's report detailing potential developments on April 7th, 1944. The designation of both guns dictated that they were meant for SPGs. These guns could potentially be installed on relatively light Panther or Tiger based vehicles, but in reality only one carrier was built, the 17 cm Kanone 72 (Sfl) Geschuetzwagen Tiger otherwise known as Grille 17. The choice of chassis for gigantic anti-tank guns remained open. Around the same time that Krupp proposed projects for superheavy guns, activity around the superheavy Maus tank resumed, simultaneously with its rival, the E-100, the 140 ton superheavy tank from Adlerwerke. In practice, Adler proposed a redesign of the 1942 Tiger-Maus project, developed by Krupp and cancelled in favour of the Maus. Even the turret used in the blueprint is the Maus turret from January 1st, 1943, also proposed for the Tiger-Maus. 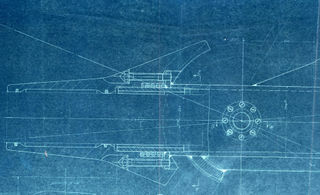 This blueprint has notes on two guns, 15 cm and 17 cm. In order to not breed any illusions, let me state that this does not mean anyone had plans to install these guns in this tank. An American CIOS report sheds light on this note. It states that German engineers did consider the E-100 as a potential platform for 149 mm and 173 mm guns. It also states that the results of their calculations were disappointing: these guns could be squeezed in, but the turret would have to become immobile. The aforementioned turret design was not even considered. In April of 1944, Krupp started work on a new simplified turret, known as the Maus II turret. The E-100 version had its mass reduced to 35 tons by reducing the thickness of side armour to 80 mm. The 128 mm KwK L/55 would be the main gun on both turrets, with a secondary 75 mm KwK L/24. A rangefinder was also added to both turrets, with the axis of rotation of this pairing directly next to it. It's interesting how a more powerful gun was supposed to fit into such a tight space. Initially, the E-100 was not a serious option for a superheavy tank destroyer. Its design was not even finished, but the Maus was already undergoing trials, and was a suitable vehicle. Correspondence mentions a draft of an assault gun on the Maus chassis that were delivered to Krupp and Porsche on May 9th, 1944, but sadly, the blueprints did not survive to this day. The 15 cm StuK L/63 was chosen as the main weapon. It was also suggested that a 30 mm automatic AA gun should be added to the top of the Sturmgeschutz Maus, but the idea was rejected on the assumption that the vehicle would be accompanied by SPAAG vehicles. The lifetime of the Maus assault gun was not long. While work was being done, it was discovered that the height of the vehicle would exceed the railroad limit. Even if the AA turret was removed, the problem remained. As a result, the Maus project fell apart, and the E-100, whose chassis was much lower, came into play. By the way, the unsolvable problem faced by Krupp and Porsche engineers directly indicates that any fantasies with a Jagdpanther-like fighting compartment are completely unfounded. On May 29th, 1944, Krupp requested permission for the development of draft documentation for a 1:5 scale model of 149 mm and 173 mm guns on the E-100 chassis. As with the Maus, the 149 mm gun received higher priority. The gun was redesigned, and its length reached 68 calibers. 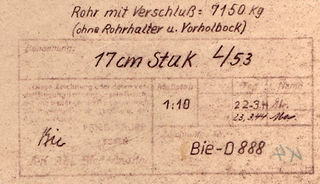 The blueprint for the 15 cm StuK L/68 on the Sturmgeschutz E-100 was ready on July 4th, 1944. The design of the gun was very similar to that of the 12.8 cm KwK L/55, meant for the Maus and E-100. The guns had an identical recoil mechanism, among other components. As for the vehicle itself, no blueprints remain. However, the slope of the front armour plate on the gun mount blueprint dispel any possibility of a front fighting compartment, same as with the Maus. The CIOS report casts a light on this project as well. According to the report, it became obvious that the tank will not meet requirements before the project was done. This fact did not stop the creators, and the tank was partially assembled. In parallel with trying to revive the E-100 as a tank, work continued to convert it to a tank destroyer. The tank would receive a fixed casemate instead of a turret. According to CIOS data, engineers also altered the tank's layout. The transmission, as well as the drive wheels, were moved from the front to the rear. Sadly, no blueprints of the StuG E-100 remain, but based on the conversions, it was likely that it would end up looking like the Ferdinand. According to available documentation, the StuG E-100 1:5 scale model was finished and shown to Guderian. However, the project was doomed. On July 10th, Hitler ordered the cancellation of all superheavy tanks and SPGs on their chassis. This did not stop Krupp from continuing to work on assembling the E-100 half-legally and, in parallel, preparing 6 hulls and turrets for the Maus, but there was no possibility of further projects. The superheavy tank destroyer died without seeing the light of day. 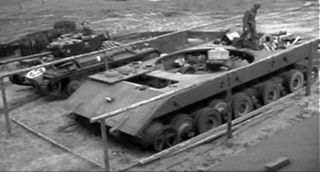 E-100 chassis undergoing allied evaluation. Since this tank was never more than a paper possibility, there are no historical images of a completed version. Documentation of the proposed 17 cm StuK L/53 gun. This is one of the two armament choices the E-100 based tank destroyer would have used. Blueprint of the installation of the 15 cm StuK L/68 with an automatic control system in the E-100. This variant received further development over the 17 cm proposal. * No historical records exist of the Jagdpanzer E-100's design specifications. In particular, the intended superstructure and weight of the vehicle is unknown. The model used in-game is what the design could have been if the project was carried to further development. One of the Jagdpanzer E-100's inhistorical armaments, the 15 cm StuK L/63 gun, is missing. The other historical armament, the 17 cm StuK L/53, might be the same as the "17 cm Pak" gun in-game. This page was last modified on 18 April 2019, at 22:04. This page has been accessed 82,212 times.